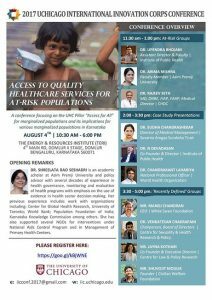 Tata Center for Development (TCD) and The International Innovation Corps (IIC) team at Suvarna Arogya Suraksha Trust (SAST), Karnataka are organizing a conference on “Access to Quality Healthcare Services for At-Risk Populations”. There will be 3 panel discussions on the implications of Central Government legislations on various marginalized populations in Karnataka. The conference will be held at the Energy and Resources Institute, Domlur, Bangalore on August 4th | 10:30 AM – 6:00 PM. Jayna Kothari, Executive Director of CLPR, is on the panel ‘Recently Defined’ Groups” which will focus on access to healthcare for two at-risk populations that have recently been addressed through these legislations – people that identify as transgender and people with mental illness.